Bank Negara Malaysia (BNM) assistant governor Marzunisham Omar says Malaysia should leverage on its first mover advantage in being a global halal hub. NST picture by MUHD ZAABA ZAKERIA. KUALA LUMPUR: The global halal industry is likely to grow between US$3 trillion and US$4 trillion in the next five years, from the current estimated US$2 trillion, backed by continued demand from both Muslim and non-Muslim majority countries. 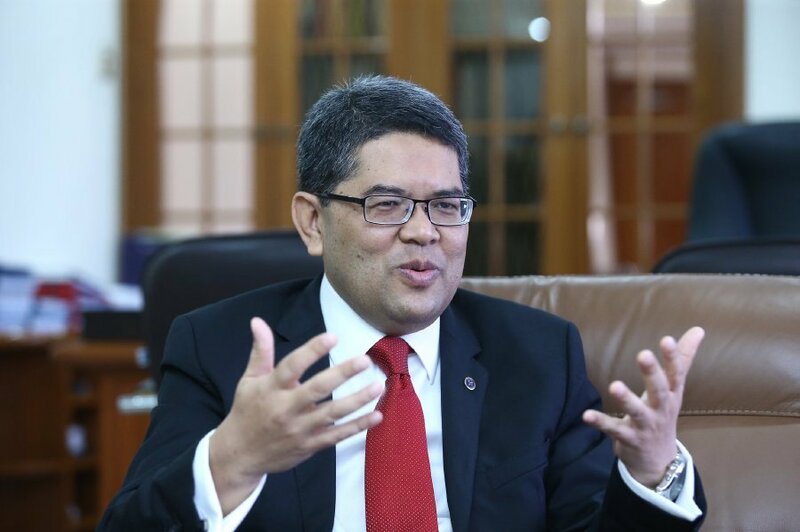 Bank Negara Malaysia (BNM) assistant governor Marzunisham Omar said Malaysia should leverage on its first mover advantage in being a global halal hub. “Malaysia certainly has the potential to expand globally because the halal market is huge. As a Muslim country, Malaysia has the infrastructure readied, especially in terms of halal certification, which is well-accepted internationally,” he told NST Business in an interview recently. Currently, there are about 1.84 billion Muslims globally, making up about 24.4 per cent of the world’s population. By 2030, the number is expected to reach 2.2 billion. The growing Muslim population worldwide presents exciting opportunity for Islamic economies like Malaysia, to commercialise halal products internationally. Speaking at the World Halal Conference 2018 recently, Sultan of Perak Sultan Nazrin Muizzuddin Shah said halal is a truly global industry which is expected to be almost tripled to US$6.4 trillion by this year. “While halal is perhaps most often associated with food and drink, there are in fact a wide range of services which can be offered including healthcare, travel and tourism and financial services,” he said in a keynote address. He said halal industry can be supported by Islamic finance that has the capacity to provide complete financing. “Bank Negara together with the Association of Islamic Banking Institutions Malaysia, Halal Development Corp and Malaysia External Trade Development Corp are creating greater awareness for Islamic finance products that can be utilised by halal industry players,” he said. Shariah-compliant financial solutions offered by Islamic financial institutions, continued to support the diverse needs of the economy in 2017. Based on Bank Negara’s Financial Stability and Payment Systems Report 2017, Islamic financing grew 9.4 per cent to RM605.5 billion in 2017 from RM553.4 billion in 2016, amid a moderate growth of 1.3 per cent in conventional loans. Islamic financing of businesses sustained its positive growth of 7.8 per cent and was channelled mainly to the business services and manufacturing sectors. Islamic deposits and investment accounts expanded by 11.7 per cent to RM672.6 billion in 2017. Of this, investment accounts increased by 6.9 per cent, amounted to RM78.7 billion, reflecting a growing recognition of investment accounts by customers as an alternative investment instrument and further diversification of funding sources by Islamic banks. “Islamic business financing was driven by SMEs, which grew by 12.5 per cent in 2017 from 13.3 per cent in 2016, amid the more moderate growth in conventional lending to SMEs by 3.1 per cent,” Marzunisham said. He said Bank Negara had allocated about RM10 billion of funding via local banks for SMEs. Of the total amount, RM7 billion in loans has been disbursed and remaining RM3 billion fund still available. “This fund is revolving based on the repayment. Then it can give out more loans. There are also other various special funds under government ministries as well,” he said. Marzunisham said the halal industry is growing rapidly primarily in food and beverages (F&Bs) and he opined that Malaysia should be able to into the growing global demand for halal food. Meanwhile, halal pharmaceutical and cosmetic products are gaining traction, with Muslims all over the world becoming more conscious of the need of halal product. “I have no doubt that the contribution of halal industry to the Malaysia economy will become bigger as we move forward,” he added. Marzunisham said Malaysia is the global leader in Islamic finance, citing that the country is the largest sukuk issuer, representing 36 per cent of the total global US$99.5 billion sukuk issuance last year. “We are also one of the biggest players in the world in terms of Islamic banking assets. We have a comprehensive Islamic financing system in Malaysia with the increasing trend of corporates raising funds through sukuk rather than conventional bond,” he said. He said Malaysia is witnessing the increase utilisation of Islamic financing, especially by businesses and SMEs. “Currently, 22 per cent of loans given out to local SMEs are Shariah-compliant. Going forward, Malaysia’s Islamic finance should offer more competitive products at the right pricing to compete with conventional financial players. “The focus of Islamic finance is not to cater solely to Muslim but it has to be competitive for all consumers,” he said.